Complete list of Children's Services in Pakistan. You can find the updated list of Children's Services in Karachi, Lahore, Islamabad, Rawalpindi, Multan, Peshawar, Quetta, Faisalabad and other regions of Pakistan with their address, maps, locations, vendors and consumer reviews. You can also compare the Children's Services here and find the best Children's Services here. You can also find the jobs related to Children's Services here. 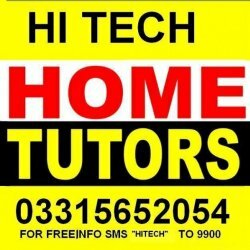 HI TECH HOME TUTOR is the company working in Islamabad and they provides very satisfactory home tutions to the children.